BELMONT — The Bronx Zoo will soon have a new attraction for the lionhearted — a high-flying zip line. 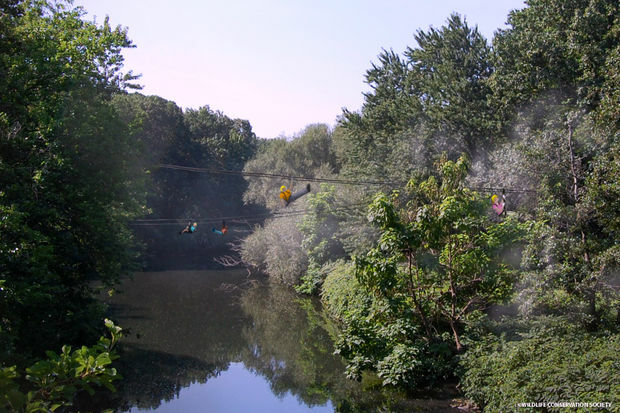 The zoo said it plans to build the ride so that brave visitors can criss-cross the Bronx River 45 feet in the air. "It’s an amazing river in our city, but not everybody gets to see it," said Sue Chin, the vice president of planning and design and chief architect at the Wildlife Conservation Society, which runs the zoo. "Certainly, they don’t get the experience of seeing it this way." 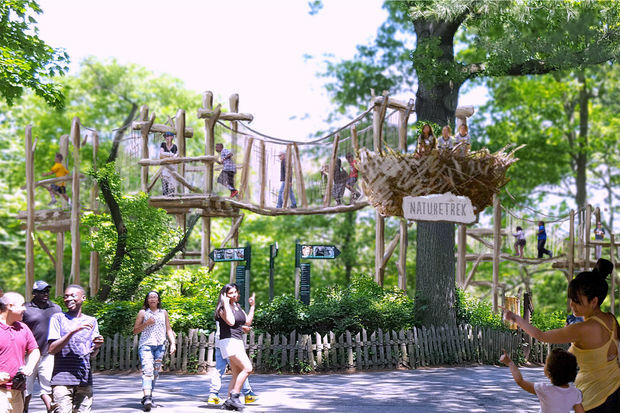 DNAinfo New York got a first look at the zoo's designs for a zip line and a kid-friendly, netted adventure course called the Nature Trek. Both are expected to open during the summer of 2017. The Bronx Zoo said it plans to build a kid-friendly, netted adventure course called the Nature Trek. Chin said the aim of both attractions is to plop visitors into nature in unique ways. The zip line will start on a tower on the west bank of the Bronx River. Riders will strap into a harness, and, with the help of gravity, zoom along a 375-foot wire to another tower on the east bank of the river. Another wire will take riders back to the west side. All the while, the riders will be eye level with the top of the trees in the zoo's 265-acre forest. Those who are able to calm their nerves as they zip along will have a few seconds to survey the river's lush wetlands, which serve as an important layover spot for bird migrations. Chin said that while the zip line will be for visitors ages 7 and up, the Nature Trek will be open to little kids. Young explorers will be able to scramble through a course filled with moving logs and rope bridges surrounded by netting. "I guess the best way to explain it is you can't fall," Chin said. "You're always safe." The Nature Trek will also have a tree house and a play area where kids and their families can act like animals by building a nest, burrowing tunnels and making tracks in sand. “It’s really about engaging the younger kids in activities that focus them on nature and how to look at nature differently,” Chin said.